I have been enamored with interiors since I was a child. Growing up, there were certain houses that I loved to visit because they were so pretty and “put together.” Those environments always made me calm and happy. Obviously, my visual aesthetic environment affects me very powerfully. It is something in my bones that has always been there so I am a bit of a decor-fiend. 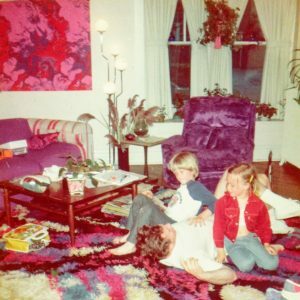 I grew up in an old house outside of Chicago that my parents decorated in a 1970s funky style with lots of chrome, fuchsia, purple, kelly green and plants everywhere. They were among the few in east Wilmette to go so avant garde in their decorating. 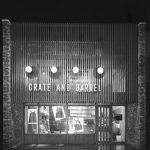 Crate & Barrel‘s original Wells Street store, where Marimekko and Heller were king, and the Chicago Merchandise Mart were my parents’ favorite places for decorating. That was my normal. 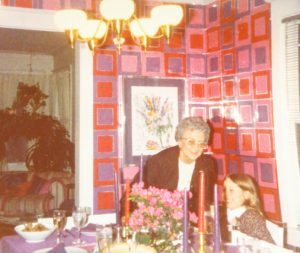 In the 80s my friends’ parents started decorating in very preppy, classic designs. Everything matched or was coordinated. 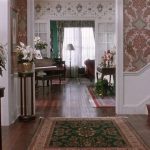 Great examples of the era are the houses from the towns in which I grew up – in the movies Sixteen Candles, Ordinary People, Risky Business and Home Alone. Laura Ashley and Ralph Lauren abound. The 1990s brought beige to my life. I was very excited to set up my first proper home after finishing college. Even though I was a die-hard collegiate hippie, I saved every penny I had to purchase a brand new, sand colored Lawson-style sofa, just like this Crate & Barrel sofa, for my apartment living room. 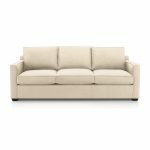 With a couple of necessary exceptions, it is still the most expensive piece of furniture I ever bought – I think it cost $700. 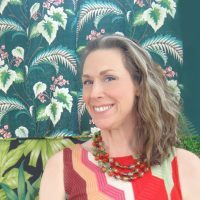 I had an old wooden trunk for a coffee table painted navy blue, an Indian print rug, and lots of woody accessories, all of which have come back in style with a vengeance as Boho Chic. Pottery Barn, Restoration Hardware and Williams-Sonoma ruled. Then in 1995 I moved to Chicago and everything changed. I started working full-time in the film industry and was reintroduced to the mid-century modern and retro looks, I had learned about in my college Art History classes, by all of the stylish people I was meeting in my film work. Over the 10 years I worked in film I shopped in thrift stores and junk shops all around the city. My film-maker, artist and indie-rocker (poor creative people) friends each had their own unique way to decorate their spaces with very little cash and a lot of enthusiasm. It took all of those design-life experiences to bring together my current modern-eclectic style. I have kept my teenage hippie ways and focus on keeping our home and our family living clean. I am a stickler for natural fabrics and pieces made by companies who address sustainability and our environment. I reuse and repurpose everything possible and actually prefer used things. I am a saver and even though my husband Steve sometimes gets frustrated with the amount of “stuff” we have, I often find a use for the things I’ve saved and he always says how impressed he is with my resourcefulness. My kids are growing up surrounded by vibrant colors and cheerful design in a home where everything in it has a story and is loved. 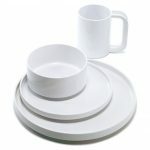 By teaching them my point-of-view, that there is purpose and care behind each item and its placement, I hope to instill in them the value of creating a madly happy home.